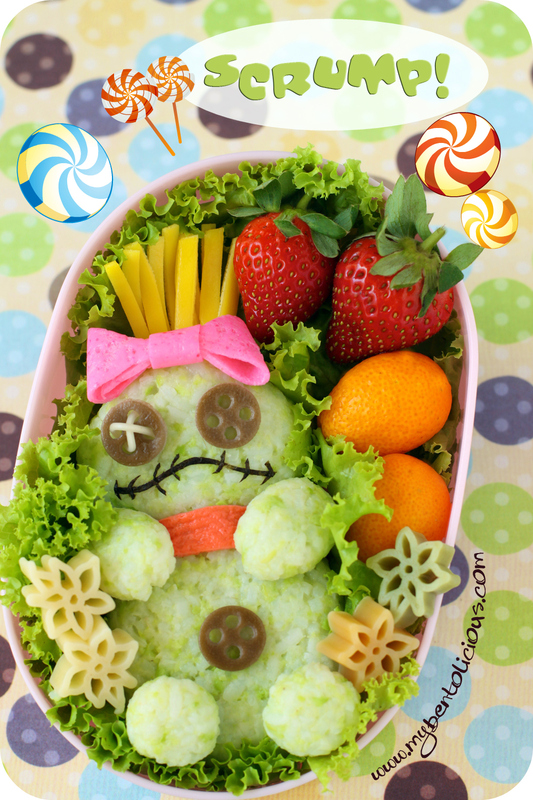 Today's snack bento idea came from my daughter. When I asked her what should I made that was not too spooky and still cute for Halloween theme bento. She answered me directly: 'Scrump'!! I didn't have any idea what she meant until she told me Scrump is Lilo's doll in Lilo & Stitch Disney movie. And then I got it. So I used edamame rice to get the green color for the Scrump. Made 2 big rice balls for the head and body part and 4 small rice balls for the hands and feet part. All were done with hand molding. I stuffed salmon flakes inside the rice balls so I could have extra space to put the strawberries and kumquats in the box. Add 3 colors flower shapes pasta for decoration. I didn't make a smooth egg sheet for pink ribbon and red scarf. I didn't even strain the egg mixture this time. Just because I wanted to have the effect of wrinkle fabric for both ribbon and scarf. What do you think? It does not always have to make smooth egg sheet right? hehehe ... Button eyes were made of choco egg sheet and regular somen. Small straws were used to punch out those button holes. Your bentos always look so pretty and perfect! Super cute. I watched Lilo and Stitch again recently when it came on TV, but I don't remember the doll. Maybe Im getting too old to catch those details :o) I love the button eyes and quite frankly, I think I prefer the non smooth egg sheet. Gorgeous work, Lia. so cute! I like the punk hair and the details to the eyes! The scarf looks so real! Do you make loads of egg sheet and store? How do you store and how long can they keep? Thanks. That's amazing! It looks perfect!!!! This made me smile again, so nice to open the laptop and see such to brighten up my day. I hope I can make such nice ones! Shut The Front Door, that is so awesome and I totally want one for myself..lol!!! This is so so cute!!! I can't get over how clever you are! My daughter would love this...even though she's 15 now she always loved Lilo and Stitch! Wow, truly amazing! Showed my girl just now an she said "Is it Lilo's doll?" I was shocked because I don't know this doll either. Kids remember the funniest things. She said Stitch pulled the doll's hair; is that true too? Maybe I should watch the show, heh. An incredible work of art. Super cool!! I am speechless. Literally. I saw this and my mouth just dropped. It's so amazing.. Lia, I think this is my fave so far. Audrey, great idea! I don´t like Lilo and Stich, but this is so cute. You can realize every idea for Bento. That´s just amazing. what a pretty color the edamame gives the rice. I haven't heard of scrump before but s/he/it sure is cute! Love all your ideas. Keep 'em coming. You are an inspiration! @Ribbonlicious : Thanks a lot dear!